Let’s suppose you just created a product that is wildly new, useful and disruptive. Or you’ve created a new technology that represents a leap forward in usability, performance and customer value. Your product is amazing and now all you need to do is sell it to the masses. Which is great because you have a bullet-proof plan of how you’re going to do that. Right? You’ve already figured out how to price it, position it against competitors and identified the optimal distribution channel partners to make it sail off the assembly line and into your customers hands. Right? Wait. You mean…you haven’t figured this out yet? What about your business plan? You detailed everything in there right? Doesn’t it contain all the answers? If you’re like most start ups, entrepreneurs and corporate intrapreneurs, your business plan is probably heavy on jargon about “maximizing shareholder value” by “pricing it competitively”, “partnering with 3rd party vendors” and filled with awesome sales forecast charts that vividly illustrate that if all you get is 1% of China to buy your product you’ll make a billions. If you’ve ever found yourself in this situation, don’t worry because fortunately there is a better, more specific and believable way to build a go-to-market plan. One of the best tools is the crossing the chasm framework by Geoffrey Moore. In 1991, Geoffrey Moore wrote his first book “Crossing the Chasm” which explained that the problem many startups face in getting their product to the masses could be explained from the perspective of the classic product life cycle. The product life cycle is familiar to most marketers – when you introduce a new product that product goes through stages of adoption. 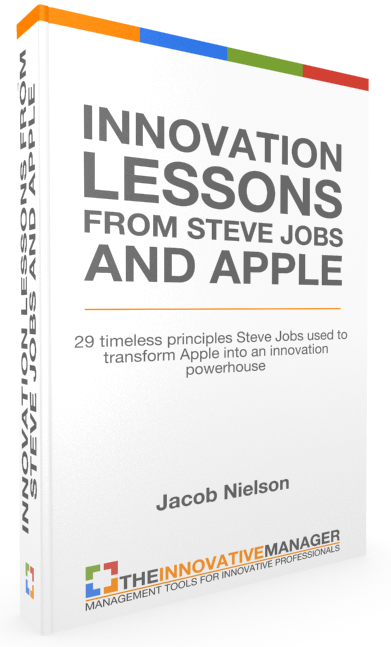 At first the product sells slowly to a few very geeky people who love technology for technology’s sake – called the innovators. Then it progresses to a larger portion of the population, a group that sees potential in the product and is willing to deal with bugs and incomplete feature sets because they are visionaries and see massive opportunities down the road. These are the early adopters. The next group of people are vastly different than the first two groups. The early majority are far more pragmatic and want solutions to their existing problems and only buy products that are fully baked (read: not beta). The late majority are made up of conservative late-comers whose primary objective is to avoid risk and “don’t screw anything up.” Laggards are the always skeptical late-to-the-party buyers who are only interested in a product after everyone else has proven the idea of the product in the first place. This product life cycle concept is nothing new but the way Moore applies it to marketing new products is insightful. The first thing Moore explained was the existence of a wide and deep chasm between early adopters and the early majority. The chasm exists because after a certain point of selling your product to early adopters you reach a sales plateau where your next stage of growth is to take the product to the masses. In the book, Moore argues that the fundamental issue entrepreneurs and product managers face when trying to cross the chasm is the fact that while early adopters are okay with incomplete features and early stage technologies in general, the early majority is pragmatic and will only accept the product once it solves a current problem they face. To them the product mus represent a practical improvement to what they do – not merely promises of future ROI potential. To position the product successfully to pragmatists, Moore argues it’s important to focus on the economic buyer and emphasize ROI as the compelling reason to buy. One of the biggest insights from Moore’s framework is the critical role of various distribution channels. In his book he argues that most distribution channels can fall into two general categories: demand creators and demand fulfillers. For example, the direct sales channel is a channel that is optimized for demand creation. This is usually the most effective channel for new technologies because unless the product category is well defined and well established in the market, you will need to have a direct sales force out in the market to explain the benefits of the product. Conversely, retail sales channels are optimized for demand fulfillment. Once a product category is well understood in a market and there is existing demand for the product, retail can be the most effective means to fulfilling that existing demand. The first addition to his model was a more specific strategy for crossing the chasm that he illustrated using the analogy of a bowling alley. 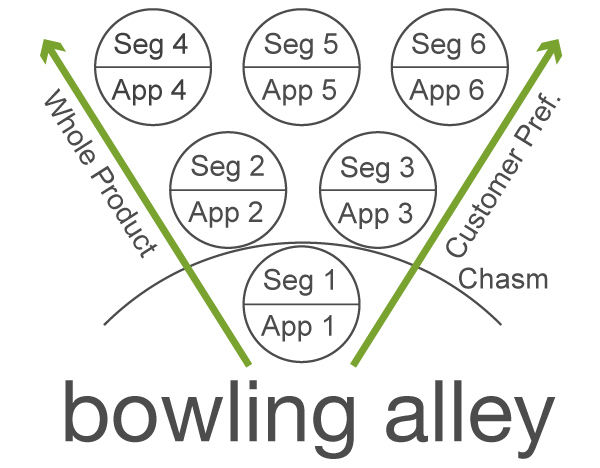 The main idea of the bowling alley is that when you go to cross the chasm and start to plan out how you will build the whole product, it helps to identify specific market segments in the early majority that you want to target and who will help you specify and create the whole product. For example, suppose you built your core product or MVP as a specific solution to a particular customer segment’s problem. 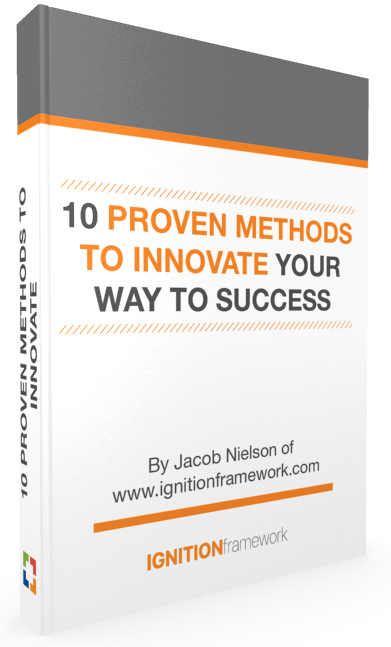 You had them in mind when you formed the initial idea and you’ve been engaged with them from the very beginning. But after launching your first version of product you realize that with a few added features or slight modifications your product could be used by an entirely new segment of customers with different but similar needs. The idea of the bowling alley is to line up all those segment opportunities and create a plan to add features (whole product) and make customizations (customer preferences) that will over time address all those particular market segment opportunities. Getting sucked up into the tornado is actually a good thing for most businesses because it represents a time of hyper-growth. However, the downside to the tornado is it can tear your business apart at the seams if you’re not operationally prepared for it. So what is the tornado? In summary, the tornado is a time when you’ve finished building the whole product and now everybody wants it and they want it now. It’s a time when your business needs to scale exponentially in order to keep up with potentially crushing demand. During this period every effort within the organization should be devoted to shipping the product as efficiently as possible. As long as you can ship, you’ll stand a fighting chance of surviving the tornado. Coming out of the tornado is a period of relative calm for your business. The whole product has been built and proven in the market and your ability to ship has also withstood a crucial test. Now the opportunities for growth are limited in scale but high in margin. This is when building an aftermarket program becomes the next big opportunity in the life cycle. Now that your product has been widely adopted and you have set many standards in the industry, your biggest opportunity is to leverage your market position by providing what Moore calls +1 aftermarket add-ons that improve the functionality of your whole product and prevent customers from having a reason to switch to a competitor. Moore’s model is perfect for those products that are so new and different that they require the organization to create a market out of practically nothing. This is opposite to the “better mousetrap” type of product where there is an established and proven market and the only thing you did was create a better product than is currently available. As an easy way to digest the framework quickly I’ve created a high-resolution infographic that describes the model on one easy-to-read file. A preview of the file is below. For just $9 you can purchase the high-resolution version by clicking . 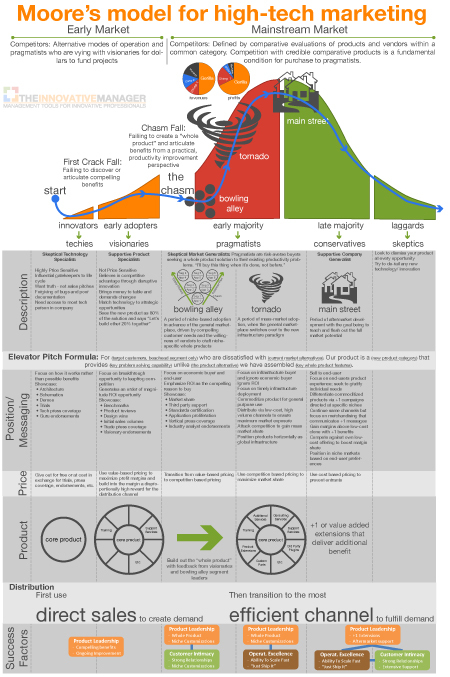 6 Responses to "Crossing the Chasm: How to Market, Sell And Improve Your Innovative New Product"
I like how your translated Moore’s theory into an integrated infographic. Great stuff. Could you recommend me any scientific publication made on this topic? Maybe you have published some work yourself? I’ve not come across a scientific paper on the theory but I am aware of a number of anecdotes that followed this pattern surprisingly closely. In fact the very project I’m working on right now is best explained by the crossing the chasm framework. We’re just getting into the bowling alley about to knock down our first pin! If I come across any papers or other materials I’ll be sure to let you know! I like the Infograph too. How can I get a copy that I can print clearly? If you subscribe to the newsletter you can download a high resolution version. HI Jake — Can you please share the URL to subscribe to the newsletter? I looked around your site but could not find it. Maybe I need to do a better job 🙂 I am very interested in the high resolution infograph. Hi Abhimanyu, you can purchase the hi res image for $9 by clicking the link at the bottom of the article. Let me know if you need anything else!